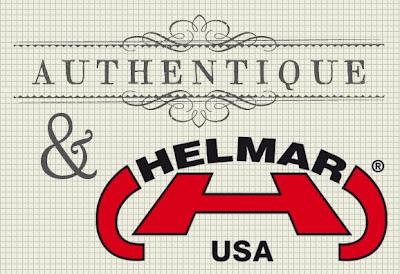 Authentique Paper + Helmar = GIVEAWAYS! We are having a great week this week pairing up beautiful products from Authentique Paper and adhesives from Helmar - and we'd like to keep spreading the love...with a GIVEAWAY! We will be giving an Authentique Paper Prize Pack to one lucky winner! - Head over to the Authentique Paper Facebook fan page and tell us how you feel about the projects you've seen so far this week (make sure you've hit "Like" to become a fan). - "Like" and leave a comment on Helmar's Facebook fan page and tell them Authentique Paper sent you. - Leave a comment (just one will do!) on this post. Do all three to enter yourself into the drawing three times! Winner must have a US/Canada mailing address. Winner will be posted on Friday. Please be sure to come back here every day this week to see more inspiration - and don't forget to check out Natalie and Tifany's projects that have already been posted. WOW! Authentique and Helmar make a great team! you have made using them and Helmar. The mailbox is adorable! Thanks for sharing. Loving this corporate combination. Great paper and great adhesive...that's pretty much all you need! I'm looking forward to viewing all the projects - love what Angie Blom made on her blog! Thanks for the giveaway and thanks for teaming up! Love Your papers! Thanks for the chance of winning a package! I (had already) liked the Authentique Paper Facebook fan page and I wrote on your wall. Thanks for another chance to win. Love you guys! Thanks for the chance to win! Love your stuff!! Already like you and Helmar... quite impressed with the Celebrate collection! thanks for the great giveaway. Thank you for the chance to win some lovely Authentique products! Thank you for 3 chances to win! Thanks for the chance to win some awesome Authentique products and some cool Helmar too!!! Love all the projects...thanks for the giveaway! Thanks for the chance to win. I've been loving the Authentique products since I first started using them. I did as you requested and cannot wait to see who wins. I just got my first tastes of Authentique and am already in love with both of the releases that you just unveiled! Thanks for the chance to win!!! I am excited about the new Authentique products coming out and am enjoying the projects you have been posting especially the little mailbox I have about 10 of these left from a few years ago and will be pulling them out this year! great products...thanks for the chance to win! I love the new Authentique collections and the new product options (diecut stickers, etc). Can't wait to start working with them! Thanks for the giveaway. i really liked all of them! love your paper. Thanks so much for the chance to win. That baby mail box is so sweet! I just adore that mailbox it's so pretty. I've been a fan on Authentiques facebook page for awhile now and I "liked" the giveway!Thanks so much for the opportunity! The mailbox is just too cute! Great stuff this week. I visited both pages, though I have already been a fan of both. Left fun love there though and leaving some here now. Hope to win some fun goodies because I love your new collections. I love that sweet mailbox! That mailbox is too adorable! LOVING the mailbox, talk about a Special Delivery, TOO CUTE! Tifany's shopping list is FABULOUS, too! I entered the giveaway all three ways, thanks SO much for the chance to win! I'm really enjoying this week and thanks for a chance to win! What a great combination! Thank you! Oh, love that adorable mailbox!! What a perfect combination!! Love you both and the great projects. Helmar you make life easy. Authentique.. You make life beautiful! Wonderful to see Helmar and Authentique! Gorgeous projects and lots of inspiration!! All the projects are fabulous! Love the projects and I'd love to win the prize pack. Thanks for the opportunity. Two of my favorite products together SWEET!!!! Both are #1 in my craft room!!!! I'm new to this brand, and just saw the latest collections. They're beautiful and definitely something that I would use. what a great combo Helmar and Authentique Paper could make some great things with both. Can't go wrong with these two products! I can only imagine how amazing this prize is going to be!! love my authentique! I love both companies so much, thank you for all of the inspiration! completely in love with Natalie's card!!! loove Natalie's card! What a great combo Authentique and Helmar! Thanks for the chance to win. Can't lose with a Helmar Authentique combo. Love the cards. Thanks for the chance to win. already a facebook fan of both companies. Love it. Thanks for the opportunity. This is an exciting giveaway! Wonderful! Can't wait to see what you all come up with! Love all the amazing projects I am seeing!! Can't wait to see what's in store for the rest of the week! WoW! Love to win this. Loving all the new goodies always brightens my news feed! Love great new papers. Thanks for the chance to win! I'm loving the new collections, especially the color palette of the Celebrate line! Thanks so much for the design inspiration and the chance to win! I love contests! It gives me something to look forward to! I <3 A!!! Awesome papers!!! Awesome projects!!! I love Authentique! I bought my first set of papers for myself for Christmas, and I am in LOVE! I would love to win some! Oh, I love the new products, I adore your textured cardstocks. I love the new products. All of the projects are great inspiration! The new lines are great and the inspiration by the DT is awesome! Thanks for the chance to win! OH YEA! I love everything you guys do!!! So excited!! Great pairing! Wonderful projects so far & I can't wait to see more. Love the mailbox, would be so cute for a babyshower. the projects are so inspiring. y'all make a great team. 3 entries for me please as I've also popped over to both facebook pages. I'm enjoying the projects tremendously and look forward to what you will show us the remainder of the week. Great work DT! I love all this paper! Can't wait to see it in the store! Super giveaway!! My favotite paper company, and THE BEST paper glue out there!! Awesome! And thanks for the chance to win!! Love Authentique Paper! Thanks for the chance. Authentique Paper is just great. Thanks for giving us the change to win. Thanks so much! I love everything! wow, thanks for the chance to win this awesome paper pack! I sooo love this collection. So beautiful. Thanks for a chance to win. Keep up the awesome work!!! Love Authentique paper. Thanks for the chance to win. Love the new collections....thanks for the chance to win. I just made my first layout tonight with your products and am very imoressed with the quality as well as the beauty. What an awesome giveaway and team up! I love your paper! That mailbox is the best! My friend Kristie Wilson sent me over for your giveaway. How awesome! Thanks for the chance to win! A great pair- having fun this week! no facebook, so this will have to do - loving your paper! Thanks for all the fun and inspiration. I would love to win! Fantastic giveaway! I left a comment at all 3 places. Well, I am now! :) I just recently was given Authentic Gathering 6x6 bundle as a blog candy prize & love it! Thanks for the chance to win!! Great stuff, loving the projects! Thanks for a chance to win a prize package. I love your papers!! Glad to see you hooked up with Helmar. Love the all the creativity this week. Thanks for the chance to win! Autheniue and Helmar..a great couple! Thanks for all the great creativity flowing this week. Off to say howdy at Helmar and you at FB! I love the colors in the Miracle collection. Green is a nice change of pace to pair with the baby blue. Thank you Authentique! I am enjoying seeing all of the fabulous projects with the new collection! Wonderful giveaway and a great week of inspiration! Thanks for the chance to win! I've done the FB things, for extra entries. favorite products! good thing you posted this one. keep posting please. Love everything!